Just as heart is an important organ is the human body, what is human existence without the brain? The brain and the mind (ability to think) is what sets humans apart from the other life forms. God has equipped only man with the mind, which is present in the brain. Without the mind and awareness human life becomes inert. To keep the brain pure, aware and active, it is important to keep the mind healthy. What can a mindless person achieve in this wood? If you want to keep these senses alive; shake them out of their slumber; or you find a feeling of negativity in your mind; or any such symptoms, then listen to this special music, We believe that this will result in making the senses alert and active and your life will be lull of success, development, enthusiasm and pleasure. It has been observed that a dynamic interaction takes place between life and music. Life has its own pace and rhythm. It has its ups and downs too. It has its achievements and failures. However, as it proceeds it sustains itself drawing upon various external sources among which music is predominant. A close and symbiotic bond exits between life and music. Music is often called sanjeevani which gives freshness and vigour to its recipient who is none else than a good listener. Our saints and sages have looked upon music as a rejuvenating force. In the Bhagwadgita Lord Krishna says I reside in those places where my devotees sing’. Such is the power of music which not only gives us peace of mind but also invigorates our spirits and activates the cells in our brain. Most of us have been leading a life full of stress and pressure. We feel the tension all the time and there is a constant drag on the faculties of our brain. The brain needs a tonic, a dose to pep up its capacity and alertness. This cd, cassette serves precisely this purpose. Salil Shaft, one of the rising stars of Hindustani music is a brilliant Moban Veena player. Son and disciple of Pandit Vishwamoban Bhatt, the winner of the coveted Grammy award, Salil has absorbed his father’s technique as well as musical vision. He plays the raga ‘Gavati’ on this product. The consonance between the notes nishad and gandhar as well as shadja and pancham engages the mind in such a manner that one feels as it one is solving a crossword in an eveninger. Such is the kind of exercise that the brain gets. Salil Shaft’s playing has an emotional touch too. 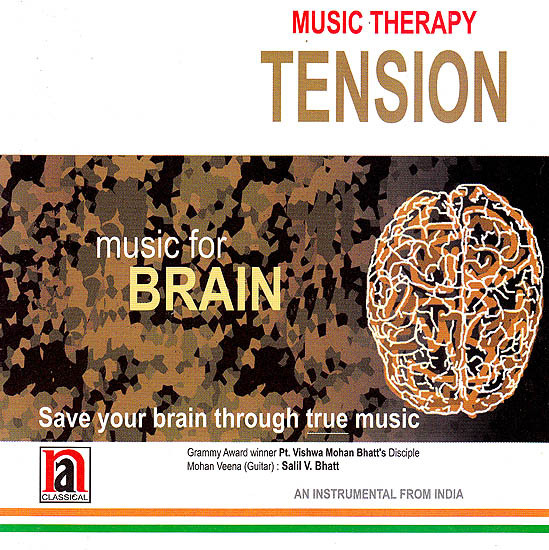 Listening to ‘Brain Tonic’ will keep your senses live. N A Classical always makes an attempt to present theme-based music. We firmly believe in the therapeutic value of classical music. Music helps one to recoup one’s energy and it provides an effective tonic for the brain. Every human body has a vast reservoir of power and strength. It lies dormant. Good music activates the cells inside the brain and then the entire body is recharged. Music affects the brain in a number of ways. It reaches the brain through auditory channels. When it touches the brain cells, they get stimulated from both the sides and this adds to energy and mental growth. Saul V Shalt represents the tenth generation of the famous Bhatt lineage. where music has been flowing for more than five hundred years. Salil is the son of the legendary slide player and India’s Grammy-Award winner Pt. Vishvamohan Bhatt. Pt. Vishwa Mohan Bhatt is the creator of the MOHAN VEENA, a revolutionary instrument, which has been hailed as a discovery in the Indian classical music scenario Salil has been intensively practicing the MOHAN VEENA for more than twelve years. lie is the foremost disciple of Pt. Vishwa Mohan Bhatt and one of the youngest and most promising exponents of the Malhar Gharana. Salil with his soulful and vibrant music is receiving accolades from the listeners and the press alike. Salilo reflects the dynamic style of rendering the classical nuances of the Mohan Veena in his concerts. His style incorporates the authentic and systematic exposition of classical Indian ‘agas and the embellishments of World music as well. Salil’s baaz (style) assimilates the ‘geyaki (vocal) and ‘tantrakari’ (instrumental) representations, which makes his playing complete with innumerable variations. Salil specializes in playing high speed loans’ demonstrating his great skit on the Mohan Veena. Salil follows the classical Indian rage authenticity to its strictest norms and creates the purest picture of every rage he plays. On this album we feature Saul Bhatt, a young and brilliant Mohan Veena player who is a son and disciple of the celebrated Pandit Vishwamohan Shah who made a history of sorts by winning the coveted Grammy Award upon his very entry into the arena of international music, Pt. Vishwamohan has groomed his son Saul who is a competent wielder of the instrument. Saul Bhatt has played The rage ‘Nat Bhairav’ which is a beautiful morning melody. ‘Nat Bhairav’ has the note shuddha ‘Re’ which gives it a unique character, it has none of the somber spirit of the rage ‘Bhainav’, The shuddha note has an energizing effect on the brain. Salil Shall continues in the same vein when he plays a haunting melody called ‘Shinnashadia’ which also has shuddha notes. He plays the raga Gavati on this product. The consonance between the notes nishad and gandhar as well as shadja and pancham engages the mind in such a manner that one feels as it one is solving a crossword in an eveninger. Such is the kind of exercise that the brain gets. Salil Bhatt’s playing has an emotional touch too. Listening to Music for Brain will keep your senses alive.